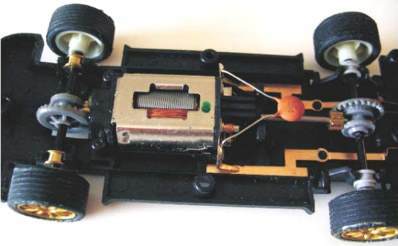 Take the cover off any traditional Scalextric car and you'll find an electric motor and one driven axle, usually at the rear, connected together with a set of gears. The gear on the motor is generally small and is known as a pinion gear while the gear fitted to the driven axle is usually larger and is known as a contrate gear. The difference in gear size allows the speed of the motor to be reduced to give the Scalextric car the correct speed on the track. The gears also increase the torque produced by the motor as measured at the drive wheels. This article explains how to go from two wheel drive to four wheel drive. To make a Scalextric car have genuine four wheel drive there are 2 methods available. The first is to add a second driven axle with contrate gear, take the drive from the other end of the motor and fit a second pinion gear to the motor shaft. This method essentially copies the primary drive. 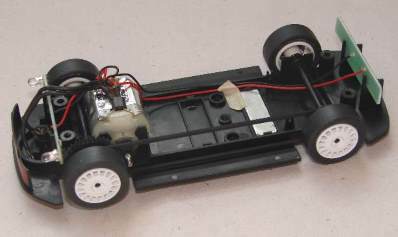 The picture above shows an SCX Subaru Impreza chassis with a second axle powered directly from the motor. This a strong and durable solution. The only real down side to this solution is cost, as two additional components (the gears) and a unique motor are needed. This method uses unique wheels moulded with integrated pulleys, the wheels are usually usually model related and unique to the car anyway, so no extra parts. Also, this solution uses the standard motor. Overall this method of delivering a 4x4 drive uses only one additional component, the drive band. So, I guess the real question is does a Scalextric 4x4 drive car work any better than the traditional two wheel drive model? The short answer is a definite yes. As long as there's some weight on all four wheels through either mass or magnatraction there will be a benefit. Acceleration out of the corners is the main benefit but cornering is improved as the rear wheels are doing less work, just like a real car. The only real downside to a 4x4 mechanism is the drag caused by the mechanical losses. With the geared mechanism there's additional friction and noise and with the drive belt method there's mostly just additional friction. This additional mechanical loss really only adds up to a reduced top speed which will not be noticed on small and medium sized layouts. The additional friction does give improved braking into corners too. Over the years Scalextric have produced 4x4 models in only 2 periods; in the 1980's with the Ford RS200 and the Audi Quattro, in the 2000's with the Ford Focus, Subaru Impreza, Peugeot 307 and Skoda Fabia models. All of these cars use the drive band solution. In the 1960's Scalextric used a small drive band to transfer the drive from the motor to the rear axle of the B1 Typhoon and B2 Hurricane motorcycle and side car models. This was to achieve two wheel drive and not four wheel drive. 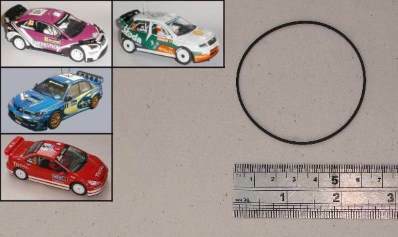 The drive bands used by Scalextric are not too dissimilar to traditional small elastic bands. However they are not elastic bands as they are moulded from a high grade synthetic rubber material similar to the material used to mould the Scalextric tyres. This material and shape gives the drive band a small amount of stretch and flexibility but more importantly good grip and a long service life. Just like the tyres on your Scalextric car the drive band will stiffen and crack with age reducing it's effect. So, just like the tyres the drive band will need to be replaced from time to time to maintain performance.